“I’m your Venus, I’m your fire, your desire!” Come on, we can all remember this song being used as a jingle for the now-popular Gillette Venus razors. As a matter of fact, anytime I hear this song, all I can think about is Gillette. Can you blame me? They make wonderful products, after all! Using their products in the bath makes me want to sing it at the top of my lungs! Okay, maybe that’s a little overkill, but the process of giving myself uber soft legs makes me very, very happy! While I usually use more basic razors, such as the BIC Soleil disposable razors, I wanted to up my game and pamper my legs for once with a better razor. 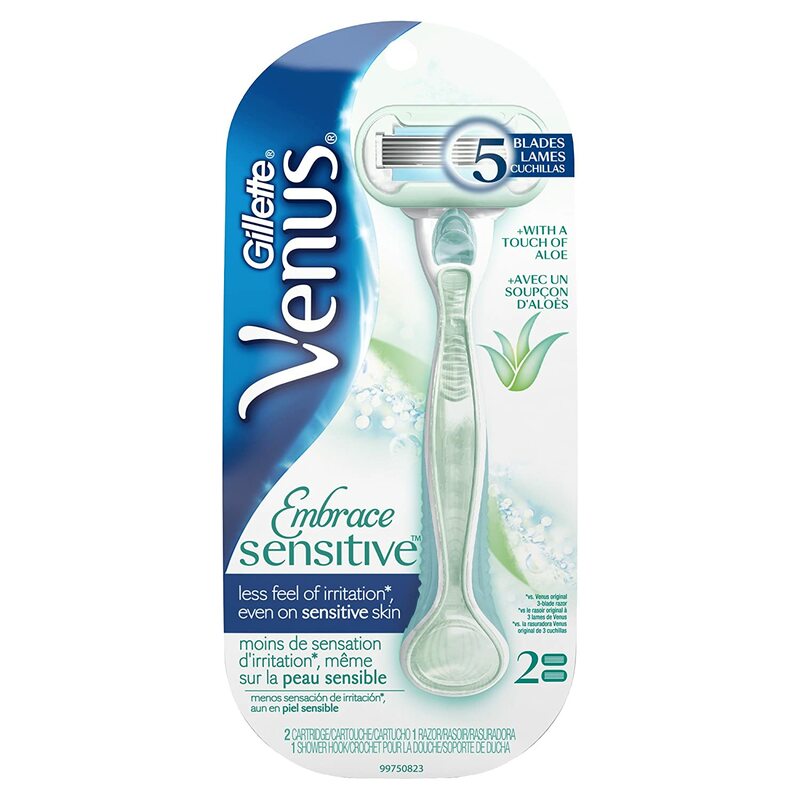 Scouring Amazon for the best razor for sensitive skin, I stumbled upon the Gillette Venus Embrace Sensitive and felt like I may have found a good match. My first reaction when I opened this razor was how cute and sleek the style is! Not that any of my house guests will be inspecting my razor’s style, but it’s the little things that make me excited! Aside from the style, here’s a few things I enjoyed about the Venus Embrace Sensitive razor. No need for shaving cream. This is a good one because not only are you saving a few dollars on ditching the can, but you’re also skipping an entire step in the shaving process! All because of this razor’s amazing lubricating strips that surround the blades. They “prime” the skin before the razors go over it, and moisturize your skin after the razors have done their job, all in a single swipe! Smooth, close shave. When I first ran this thing up my leg, I could hardly feel it doing anything! I had to ask myself “is this even working?” and sure enough, it was, and really well at that! I felt like I was trying to shave with a little fluffy cloud rather than a bunch of little razor blades. Rinses easily. It had been a while since the last time I had shaved, so there was definitely some weed whacking to do! Although it did require some periodic rinsing to clear the blades, I have to say it was much easier to do with this razor head than with others I’ve used. I don’t want to have to spend more time than I have to cleaning out my razor between swipes. Available in different types. If you’re not really in the market for a razor for sensitive skin, this same razor is available in many scents and kinds that you will love, all for right around the same price! I am grasping at straws here looking for negative things to say about this razor, so here’s the only two things I found as downsides. Lubricating strip wears down. This might be a given, but I don’t see each cartridge lasting for more than a handful of shaves, especially if you decide to use it as a full-body razor. In order to help make them last longer, keep the razor away from the water and moisture when not in use, and use that little plastic case that each cartridge comes in as a cover for the shaver head. Would I Recommend the Venus Embrace Sensitive? Absotively posilutely! This might just be the best razor for sensitive skin! I have zero regrets ever giving this a try. My legs are silky soft, I did not receive a single surprise cut, and I have zero razor bumps. ZERO. I say it’s the perfect razor for moms who might not have all the time in the world to spend in the shower, but not quite a fit for those looking to pinch a few pennies. In the case of being budget-minded, I recommend a Bic. As for me, I give it 5 stars. So what are you waiting for?